Last year, I had a chance to go to Maine Beer Company in Portland. I chatted with David, and checked out their brewery. Starting off with a 3 tier half barrel system, the worked their way up to a nice new brewhouse, I think 15 barrels. At that time, they were not kegging, and all their beer was bottled conditioned (which is how the bulk of their beer is still packaged). They are about 100 yards down the street from Allagash, and David was telling me that the brewers at Allagash came over and helped them figure out how to prime 10 barrels of beer for bottle conditioning consistently. I am always impressed at how open brewers are with the public and each other, and Maine Beer was no different. 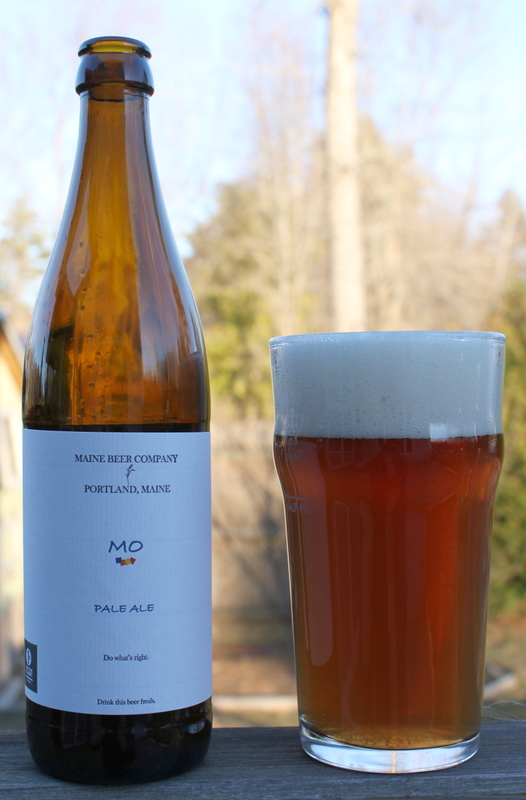 Maine Beer Company is known for their hop forward beers, a departure from the norm here in Maine, were the bulk of the breweries took their lead from Geary’s and are British in style. Maine Beer Company brews more in the “American” style, where they are not afraid of bold, citrusy hops, and use a cleaner ale yeast. They are a nice counterpoint to the more malty, estery British brews. As they are all near each other, I would love to see Geary’s, Allagash, Maine Beer, Rising Tide, and Bull Jagger just throw a block party one year for Maine Beer week. You go from English, to Belgian, to American, to German brewing styles just in those 5 breweries. It would be a good time. Anyway, I picked up a bottle of MO recently, and decided to give it a try. Described as an American Style Pale ale, I had not tried it before, so I figured it was time to give it a go. Aroma — Piney, citrusy hops, some tropic fruit as well. Not much ester that I can detect, hops dominate. Taste — Faint malt taste up front, but mostly I get hops. More of the piney flavor, it has a nice, smooth bitterness to it that comes across on the finish very nicely. There is enough malt here to round out the beer, and it has a nice body, but finishes pretty dry. Very quaffable, inviting another pint. Critique: I think this is a good, solid, American pale ale. It is probably more hoppy then most APA’s, but that is more in the flavor then in true bitterness. There is enough backbone to give it balance. It is a nicely done hop forward beer. Now I want to try their IPA, Lunch.